ec-europe posters are powerful visual materials that help patients remember important information better that if they only read it or hear it. 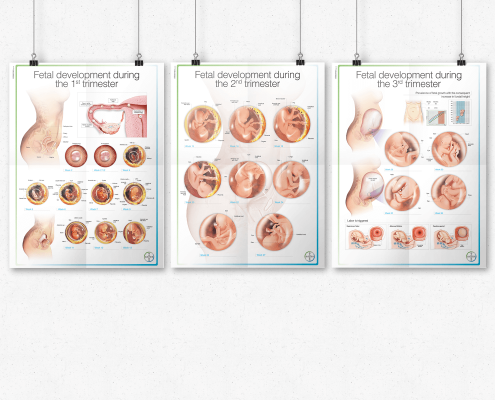 Made of high quality, full-color medical illustrations supported by referenced texts, these stand-alone large supports can be distributed and posted in a variety of settings. A 3D format is available, that brings dynamism to the educational images. DESCRIPTION: This poster provides an overview of the different types of pain that can affect the musculoskeletal system, with a special emphasis on back pain and nerve compression syndromes. It is made of full-color illustrations that explain the difference between the different types of pain, and includes descriptions of some common causes of back pain and nerve entrapment-associated pain. The images are simple yet detailed and powerfully clear, making these complex topics easier to explain to patients. 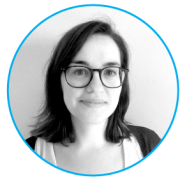 The texts are backed up by up to date medical references, making this product a practical and reliable tool for the practitioner’s consultations. DESCRIPTION: This is a series of 5 posters to be distributed as a pack to a selection of nurses who prepare pregnant women and their partners for delivery in pre-labour courses. They all share a common layout/look and feel, and they describe the following aspects of maternity: female genital anatomy, the fetal development in the first, second and third trimester, the preparation of breast for breast-feeding and breast-feeding positions, delivery and also the different baby positions in labour. They are intended to serve as an attractive and comprehensive visual aid for future parents and doctors/nurses to discuss the development of the baby and the process of labor as well as to prepare the mother for breastfeeding once the baby is born. DESCRIPTION: This full-color poster includes the symptoms and complications associated with Paediatric GERD as well as the diagnosis options. Its attractive style makes it a great visual aid for the doctor’s consultation room, since all the important concepts are covered and summarized in a comprehensive way. 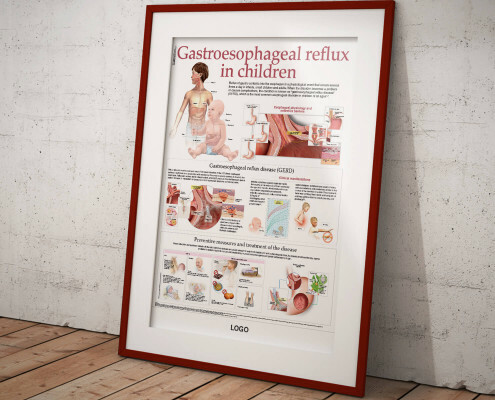 It depicts all the specific symptoms associated with paediatric GERD and distinguishes between symptoms seen in infants and GERD symptoms in older children. The poster also includes a section about the mechanism of action of proton pumps inhibitors.